OneWheel, introduced by Canadian inventor Kyle Doerksen, is perhaps the quirkiest concept device seen at the Consumer Electronics Show (CES) 2014. What looks like an awkward wheel placed within a wooden frame is actually a self-balancing skateboard that works much like how a Segway would, save for the fact you don't have handlebars. While operating this device can hardly be called "skating," it does give you the sensation of being on an actual skateboard and delivers a very smooth ride once you get used to it, according to the folks at Engadget who tried it out. 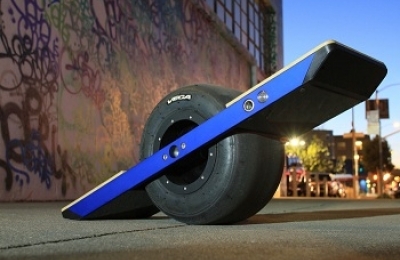 Doerksen brought the skateboard concept to Engadget's trailer on Friday last week. According to them, despite its coarse appearance, it certainly had the makings of something durable and comfortable. After seeing this, I dare to ask: How can I carry a skateboard like this around conveniently? It's not flat, and that big rubber wheel makes the whole package a bit unattractive no matter how I try to rationalize its repulsiveness. I say we work on hoverboards! We only have one year left to catch up with those colorful little devices in Back to The Future Part II. Don't tell me that a torn-off car axle is the best we can do.